Manage It 3 is Here! We just released the 3rd major version of the Manage It app. Here are some of the things that we added for you. Important, make sure you have the latest version of the app by going to manageitapp.com then clicking on the link for your device at the bottom of the page. If it tells you there is an update please do so. You can now see all your starred tasks and tasks assigned to you across ALL of your projects from one easy to read dashboard. This will allow you to get a better overview of everything you need to do without opening each of your projects. To see all of your tasks, open the left menu by clicking the button in the upper left corner of the app, then click “My Tasks”. If you do not see the “My Tasks” button above the Schedule button you might not have the latest version of the app. Just update the app on your device to get the latest. We added a new + button to the top of the app where you can quickly add a task to any project from anywhere in the app. 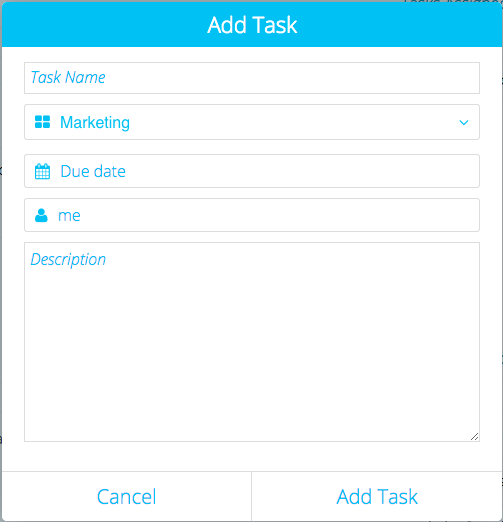 From this screen you can also add a due date to your tasks and assign the task to people in your company. We hope that if this button makes you even a few seconds more productive we have done our job! Many of our enterprise customers love their BlackBerry phones and we continue to support all of the new devices that come out. The latest BlackBerry to be released is called the “Classic” which looks a lot like the older devices but has the most up up to date OS. Manage It version 3 is optimized for the screen size of this device and we made many speed improvements to make it work great on this device. A big focus for Manage It version 3 was to make the app faster to open and use. Some people will see over 100% speed improvement over the previous version of the app! We also squashed many bugs thanks to your reports, as always if something is not working for you please let us know so that we can fix it. Make sure you have our latest app! Go to your device’s app store and click update to keep Manage It up to date.